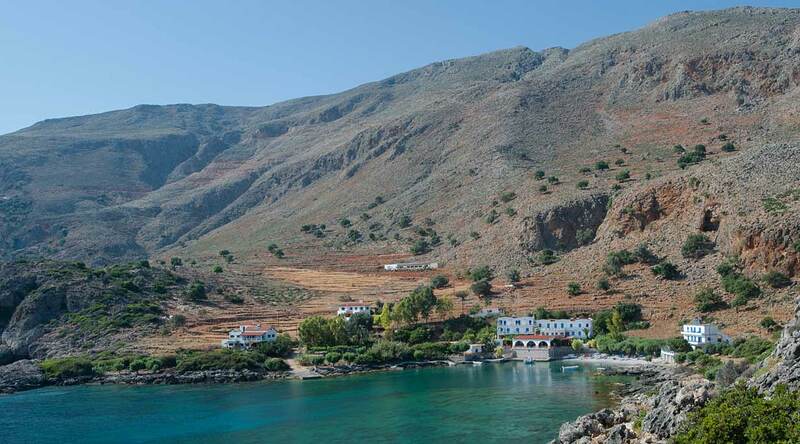 The Old Phoenix rooms and restaurant is situated in one of the most beautiful and unspoilt regions of southwest Crete, in the bay of Finix, about 15 minutes walk from the picturesque village of Loutro. We are a small family business which has grown slowly over the past four decades and built a solid core of regular customers who visit us year after year for their holiday on Crete. If you want to retreat away from mass tourism, noise and wish to be in close contact with unspoilt nature this place is for you. Come once and you too are likely to visit us again and again. The Old Phoenix can only be reached on foot or by boat (or by car on a track). There is no sound of traffic and everything moves at a slow and laid-back pace. Bear in mind though that in the summer months our hotel is popular with families so there will be children around. All our rooms have large balconies overlooking the Libyan sea. Our food is simple, traditional Cretan fare, cooked daily from fresh local ingredients by the family. Despite the quietness there is a whole range of things to do including lazing on the beach, snorkeling in some of the clearest waters in the Mediterranean, easy walks to serious hiking, canoeing and excursions by boat to the neighbouring villages.